The NBA has made it clear that the G-League is going to operate as a minor league of sorts. This might seem obvious but it wasn’t always the case. In the 1980’s, the Continental Basketball Association (CBA) served as the unofficial minor league for players. Eventually the CBA had financial issues that forced them to fold. Most fans want to see college basketball as the NBA’s minor league system. But the college game falls short, in part, because of the NCAA’s unwillingness to move to rules more in line with FIBA. The G-League serves as a player development tool the league so desperately needs. It allows NBA bench players to get an opportunity to grab minutes and play more significant roles. In theory, this will allow players to be able to bounce between the parent club and the G-League. 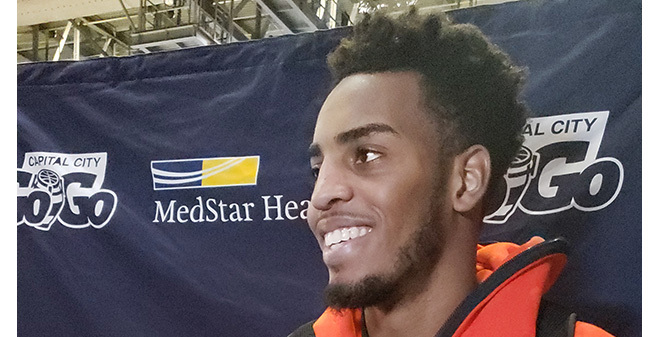 Washington Wizards first round pick, Troy Brown Jr., is the latest in a long line of young players to experience this. Last week, he was sent down to the Capital City Go-Go. The move gave Brown Jr. his first opportunity to get major game minutes and play a bigger role on offense. “With the Wizards I’m more of a role player, active defensively guy,” said Brown Jr. In Go-Go’s Friday night loss to the Canton Charge, Brown Jr. had to adjust to his new role as a major contributor. Before being sent down, Brown Jr. had appeared in just eight games for the Washington Wizards. In those games, he averaged just 5.2 minutes a game. On Friday night, he played 32 minutes. It was the most minutes he had played since he days at Oregon. “I thought he struggled a little bit the first game but he hadn’t played substantial minutes in a long time,” said Go-Go head coach Jarell Christian. In the rematch on Sunday, Brown Jr. seemed to make the necessary adjustments. He turned in a 19 point, 7 rebound, 6 assists effort in 31 minutes. “To come down here and to have more freedom to be able to play my game. It was a little hard for me to adjust but I felt like today (Sunday), I kinda did it”. For players getting moved down, success hinges on being able to quickly adjust to the G-League environment. A bigger role comes with a lot of responsibility. A player coming down must fit in quickly knowing they will be taking shots and opportunities away from players who are assigned to their G-League team. That’s a delicate balance. In Brown Jr’s case, his appearance fit in nicely because Chasson Randle left to go train with USA Basketball. For the Wizards front office, they saw a two-game stint of what Brown Jr. could eventually do for them once he’s earned NBA minutes. It’s why the NBA G-League is so important. Young players who have NBA potential need to get minutes while learning the NBA game. Most think the NBA will eventually get rid of their one year college requirement which is why the G-League’s success is so important. Draft picks aren’t always being looked at as players who need to make immediate impact and, hopefully, this will cut down on the European “stash and dash” which has become popular in the NBA Draft especially in the lower part of the first round. After playing two games with the Go-Go, Brown Jr. was back on the bench for the Washington Wizards in their 135-131 overtime win over the Houston Rockets. There was no role for Brown Jr. that night. The adjustment continues.